These exceptionally tender and appealing thumbprint cookies are decorated with dabs of assorted colorful jams in the centers and, if you like, with bits of pistachios and almonds as well. The cookies look wonderfully festive and jewel-like, but are actually easy to prepare. Preheat the oven to 350 degrees. Grease several baking sheets or coat with nonstick spray. In a medium bowl, thoroughly stir together the flour, baking soda, baking powder, and salt; set aside. In a large bowl, with an electric mixer on medium speed, beat together the butter, sugar, and egg yolk until fluffy and well blended. Beat in the cream cheese, vanilla, and lemon zest until evenly incorporated. Beat or stir in the flour mixture until well blended and smooth. Let stand for 5 to 10 minutes, or until the dough firms up just slightly. Shape portions of the dough into scant 1-inch balls with lightly greased hands. Dip the tops of the balls into the pistachios or almonds, if using. Place, nut side up, on the baking sheets, spacing about 1½ inches apart. Using your thumb or knuckle, press a deep well into the center of each ball. Place about ¼ teaspoon jam in each well. Bake the cookies, one sheet at a time, in the upper third of the oven for 9 to 12 minutes, or until the cookies are tinged with brown at the edges. Reverse the sheet halfway through baking to ensure even browning. Transfer the sheet to a wire rack and let stand until the cookies firm up slightly, 2 to 3 minutes. Using a spatula, transfer the cookies to wire racks. Let stand until completely cooled. Wipe off the sheets and regrease them before reusing. 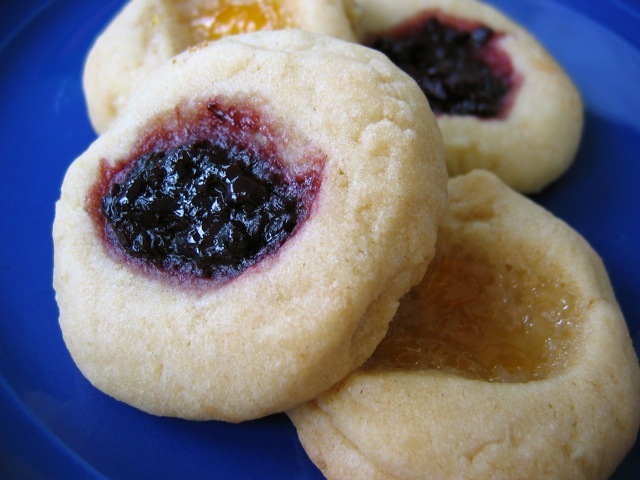 Be sure to fill the cookie indentations with jam or preserves, not jelly. Most jellies are too thin and will bubble over and run during baking.